Despite a 2011 Supreme Court decision that struck down a California law banning the sale or rental of violent video games to minors, New Jersey lawmakers are now considering similar legislation. In an apparent attempt to skirt the Supreme Court finding that games are First Amendment-protected free speech, the proposed law would require parental consent for minors to obtain M or AO-rated games, rather than banning such transactions outright — but experts say it would likely still be unconstitutional. The NJ SAFE Task Force, made up of “former attorneys general, mental health professionals and educational leaders,” was commissioned by Governor Chris Christie to study the problem of gun violence and make recommendations to curtail it. 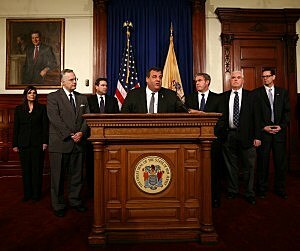 Earlier this month, the group issued its report, and Christie announced a resulting package of proposed legislation. In addition to the proposals regarding background checks and mental illness, the governor urged legislators to bar retailers and rental outlets from distributing games rated M or AO on the ESRB rating scale to minors without a parent or guardian present. But aside from being unnecessary, any law that regulates distribution of video games based on content is unlikely to stand up to constitutional scrutiny. In his majority opinion for the 2011 case, Brown vs. Entertainment Merchants Association – a case that saw CBLDF’s amicus brief cited in the majority decision — Supreme Court justice Antonin Scalia made it clear that video games enjoy the same First Amendment protections as any other medium, and pointed out that the government has never tried to protect children from violence in, for instance, the fairy tales collected by the Brothers Grimm. Scalia also evinced scepticism that any link could be drawn between violent video games and real-life behavior, and there is no reason to think that he and the other six justices who sided with him have changed their minds since then. The Court has established an extreme reluctance to allow government regulation of free expression in the “marketplace of ideas” and is unlikely to be convinced that there is adequate justification for the parental consent provision. Here’s hoping that New Jersey lawmakers realize this and steer their efforts to curb gun violence in another direction.